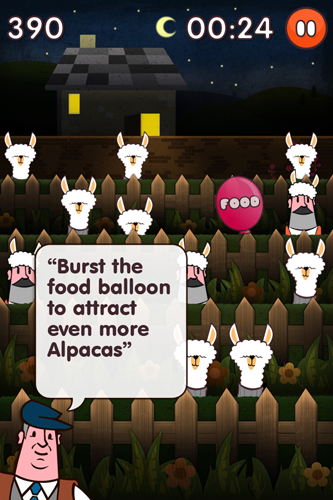 Alpaca Farm is a family friendly game for the iPhone and iPad. Recently released as a Free version it combines beautiful graphics with simple but addictive gameplay. We're hooked already. Players have to help the farmer keep his inquisitive Alpacas out of trouble. With trouble (in the form of cunning foxes and meddling rival farmers) lurking behind every hedge, fence and milk churn that is more difficult than it sounds! Test your reaction speed by catching as many Alpaca's as possible in the allotted time to become the fastest Alpaca Tappa! The free version is a taste of whats to come with rumours that a full game with more power ups and varied gameplay is on the way. Indeed if you want to shape the next release play the game and post your feedback to the Alpaca Farm Game Facebook page and you could be in with a chnace to win one of three iPads. You also have the chance to submit name suggestions for the main characters which is pretty awesome. Keep an eye on their twitter feed for more game updates and news. Happy tapping. If you want to test your speed you can download Alpaca Farm today.